I am a planner. I plan for everything in my life, sometimes months in advance. I know when I’m going to run out of essentials like coffee filters, toothpaste, etc. Even before I run out, I get extras to back up the ones that will run out. This kind of planning is evident in my teaching as well. My reading lessons are structured the same way each week: Monday-class book, Tuesday-language work, Wednesday- current events, Thursday- class book. Not only do I have this structure in place, I also have articles printed and ready to hand out for the next month. I have homework packets prepared weeks in advance. I have idioms and figurative language picked out to teach for the next few weeks as well. The students benefit from the structure, but the sole source of information is me– I am filtering everything that comes into the class. After reading “Why School?” by Will Richardson, I made a huge jump (for me, at least). I sat down at the beginning of my group, and told them that I am also a learner, and I read a book that changed my thinking about the way I teach. I explained that I am going to start by changing our article day. 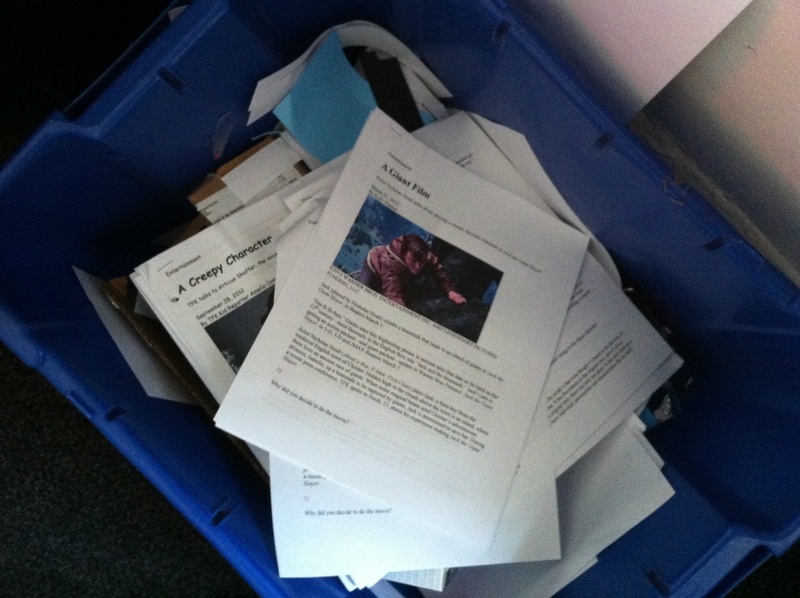 I gathered my four weeks of printed articles and had them watch me drop them into the recycling bin. I explained that I wanted them to be in charge of what articles we are learning, not me. One by one, they each had a turn clicking through and picking an article on Time for Kids while the screen was projected onto the SmartBoard. On a day when we would usually do round-robin reading of a pre-selected article, we all learned about the bounce-back of the tiger population, what school lunches look like in five other countries, the Kids Choice Awards, and the debt crisis in the United States. They were interested in their peers’ selections, had insights and interests I never expected, and were excited to be in the driver’s seat for their own and their peers’ learning. I ended up teaching them skills to navigate the computer while they were reading, discussing, and comprehending more material than we usually would. They learned about the format of a URL and how to zoom a web page for a closer look. Who knew I’d be teaching those skills to my third grade reading group? I let go, and they learned… By the way, I learned, too! Wednesdays will look so different to me now– I’m looking forward to what I’ll learn about next time. I’m also contemplating the other days and how I can implement a learner centered curriculum in my classroom for both me and my students.